The Big Wobble: The TRILLION-ton iceberg which is the equivalent of a 64-storey tall building and broken free will NOT raise the world's sea levels. The TRILLION-ton iceberg which is the equivalent of a 64-storey tall building and broken free will NOT raise the world's sea levels. A TRILLION-ton iceberg which has broken free from Antarctica will do nothing to raise the world's sea levels. But it has changed the face of the southern continent forever. "The iceberg weighs more than a trillion tonnes, but it was already floating before it calved away so has no immediate impact on sea level," a Swansea research team said. It will likely be named A68. The massive ice cube is twice the size of the Australian Capital Territory, four times the size of London and twice the size of Luxembourg. It is about 350 metres thick. But the 5800 sq km block of ice is not the largest to have 'calved' from Antarctica: an 11,000sq km 'berg' was seen to break loose from the Ross Ice Shelf in 2000. This does not reduce the significance of the breakaway, which happened at some point between Monday and Wednesday. It has reduced the size of the Larson C ice shelf by about 12 per cent. It is now at its lowest ever recorded level. This is the third ice shelf on the western peninsula of Antarctica to undergo massive ice loss in the past two decades. The Larsen A ice shelf fragmented in 1995. In 2002, Antarctica lost 3250 sq km)of ice when the Larsen B shelf collapsed. The new berg itself is destined to crumble into the sea, scientists say, fragmenting as it drifts north into warmer waters. Assistant Professor Duanne White from the Institute for Applied Ecology at the University of Canberra says the past few decades have seen the collapse of over a dozen ice shelves on the Antarctic Peninsula. The glaciers sitting behind Larsen C hold relatively little ice in the context of the whole of Antarctica. "However, should this be the start of the breakup of Larsen C, it adds weight to the question of the stability of the larger, more southerly ice shelves and ice drainage systems, which have the potential to contribute several metres to sea level rise during the next few centuries," she says. It is as yet uncertain what the giant iceberg represents. 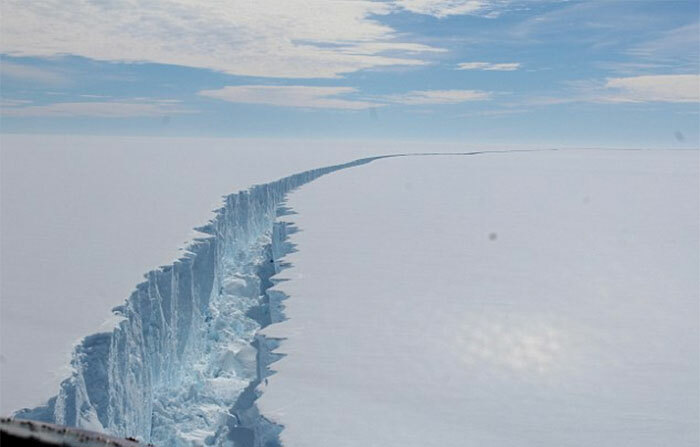 The ice shelf could regrow, replenished by glaciers steadily feeding it from higher terrain. Or, like the once nearby Larsen B shelf, it could become less stable and completely collapse. Swansea University researcher Adrian Luckman says opinions are divided. "Our models say it will be less stable, but any future collapse remains years or decades away," he says. The rift which produced the breakaway was first observed in the 1980s, he said, and was already a 'long established feature'. What is not in dispute is the steady decline of the extent of nearby ice sheets. according to recent data from the European Space Agency, the gargantuan berg - at its deepest - extends some 210m beneath the surface. That's roughly the equivalent of a 64-storey tall building. The ESA determined the berg's size and depth through monitoring satellites: the CryoSat mission and the Copernicus Sentinel-1 radar pair. Overall, it contains 1155 cubic kilometres of solid ice.